"[The Coynes'] logical thinking exercises will help readers to maximize their ideation skills, both by systematically exploring every possible nook and cranny of an issue to find new ideas, and by systematically evaluating and honing the results." -Publishers WeeklyFrom business strategists (and brothers) Shawn and Kevin Coyne comes a breakthrough approach to developing better ideas. 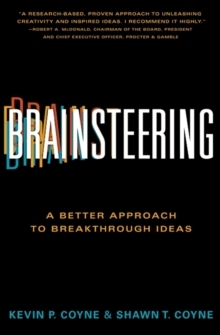 Brainsteering is a comprehensive, research-based, tried-and-tested approach to the principal challenge in business and life: how to consistently and effectively create powerful new ideas. Brainsteering offers a way out of fruitless brainstorming sessions. In the tradition of the Heath Brothers' Made to Stick and Gordon Mackenzie's Orbiting Giant Hairball, the Coynes deliver the surest path to success for anyone looking to unlock the secrets of innovation.